First run of the final week and ended up dropping to a walk near the end of the 28 minutes. 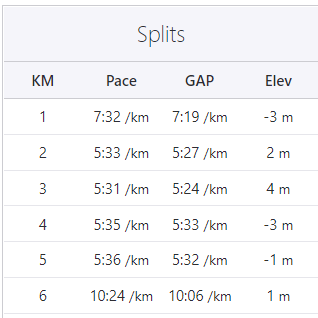 Disappointed, even though I was slow-jogging and making a pace of about 5:30 min/km on average for the main kms in the middle.. Final run of week 7’s set of runs. Next one is week 8 — two 28min runs, then the 5k/30min run. First long run since my week away. 25 minutes running non stop and my body screamed at me to stop at 4km. Busted through and did one more round, taking it to 5.6 km. Strava logged it as 5.9 km, with moving time of 39:49, with a best km time of 5:24 min/km. I was using the Spotify running playlist to keep my cadence steady and it showed. The first and last kilometres were the warm up and cool down walks, hence the skewed time. This article just goes through my tinkering with Kubernetes on AWS. k8stest.blenderfox.uk. 172800 IN NS ns-1353.awsdns-41.org. k8stest.blenderfox.uk. 172800 IN NS ns-1816.awsdns-35.co.uk. k8stest.blenderfox.uk. 172800 IN NS ns-404.awsdns-50.com. k8stest.blenderfox.uk. 172800 IN NS ns-644.awsdns-16.net. You can also add it to a bash script and source it. Each with their own Debian image. While the cluster starts up, all the new records will be set up with placeholder IPs. NOTE: Kubernetes needs an externally resolvable DNS name. Basically, you need to be able to create a hosted zone on a domain you control. You can’t use Kops on a domain you can’t control, even if you hack the resolver config. To check the cluster state. Now let’s create a job to deploy on to the cluster.